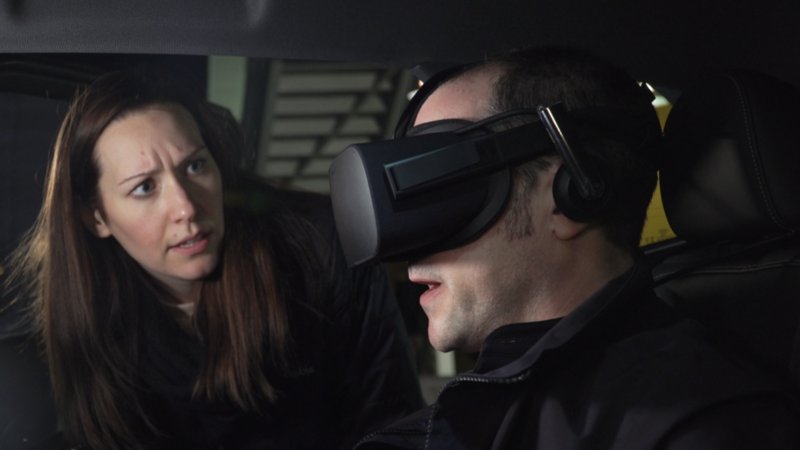 Enlarge / Yes, I am wearing VR in the backseat of an electric car. Yes, this is Peak CES. LAS VEGAS—I’d been on the ground for less than twelve hours before I strapped on the virtual reality headset. It was only 8pm but felt far later thanks to time zones and air travel. I had already been chauffeured about that afternoon by a self-driving car, and here I was sitting in the back seat of an Audi e-tron at a race track a little south of the city. I’d already reached Peak CES, yet the show wouldn’t even officially start for another 36 hours. We were at Speedvegas for a rather exclusive look at Holoride, which Audi thinks is the next big breakthrough in in-car entertainment. According to the company—which has spun Holoride as an independent startup—it’s a “radically new way to entertain backseat passengers in a brand new way.” The idea is deceptively simple: you take telematics info from the car in real-time and use it to construct artificial environments in VR. Or, to put it another way, imagine you’re flying in a spaceship, and every time the car accelerates, brakes, or turns, your spaceship accelerates, brakes, or turns as well. Audi’s idea piqued enough interest to get Disney attached, and the studio’s games division worked with Holoride to construct the demo we were about to experience. I was hoping that meant a ride in an X-Wing, but Audi and Disney have had a long-time partnership that has shown up in multiple Marvel movies, so instead of BB-8, I was joined by Rocket Raccoon, the foul-mouthed trash panda from Guardians of the Galaxy. Enlarge / A concerned-looking person from Audi makes sure I’m wearing it right. Or it’s a screenshot from an episode of Black Mirror—you decide. I’ll admit it, I was skeptical. I’m not much of a VR aficionado—the headsets never sit comfortably over my glasses, so it’s always a case of being squished or having a blurry experience. But I’m game to try most things, and unlike the last time Audi handed me a VR headset in a car, I didn’t have to do the driving this time. As a proof of concept, the demo excelled. Flying high above the pink glow of whatever planet we were orbiting felt pretty cool, as did blowing up asteroids or bad guys as the need or urge arose. I can’t lie; I did begin to feel a little queasy toward the end as we started negotiating some of Speedvegas’ bends with more lateral Gs than you would ever normally experience on the public road. But even I could see the possibilities—it really was like a Disney theme park ride all to myself. In space. Holoride’s technology is being developed to be agnostic to both OEM and VR headset brands, so they won’t be locked into just Audis or the Oculus—this is why it has been spun out as an independent startup. This wasn’t our only glimpse at CES into the future of in-car entertainment, but its demo certainly was the most spectacular. As the engineers and designers see it, autonomous driving increases the need—or the opportunity—for better distractions on car rides. Certainly, the onboard AI assistants that are fast becoming inevitable are going to hear a lot of “are we there yet.” In the near term, that means infotainment systems with a big screen for every seat, each capable of playing its own HD content piped over multigigabit ethernet. Or, if you buy a Byton EV, a gigantic dashboard-wide screen. After that, things start to get much more intriguing. CES-watchers with good memories will recall that Audi and Disney aren’t the first OEM and studio to attempt combining VR and real-time telemetry; back in 2017 Honda and ConnectedTravel did something similar. This year, those two were back with the latest incarnation of Dream Drive, decidedly less flashy but also a lot more polished and closer to deployment. More mixed or augmented reality than virtual reality, the Honda Dream Drive: Passenger app runs on tablets, not VR headsets, but it still uses real-time data from the car (via Wi-Fi from the in-car hotspot) to inform the experience. Games have elastic or variable durations, with the layout being generated based on data from the navigation system. One game demo featured a Lego-scape that mimicked the (virtual) journey we were on; others could point out interesting landmarks as they passed by. This would be easier to illustrate if the (simulated) road ahead was about to turn, but the layout for the Octonauts game on the iPad was being generated based on the (again, simulated) route we were driving. 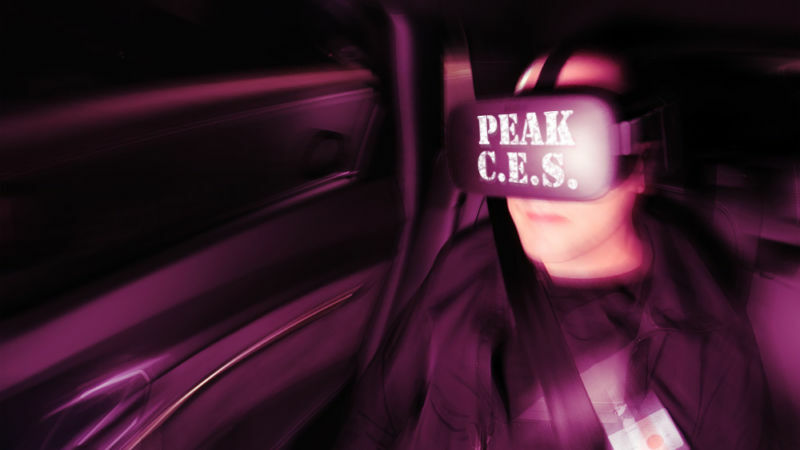 Incidentally, never mind VR causing motion sickness; you should try sitting in a car where the windshield looks like you’re driving, but when you look out the side window you’re stationary in the North Hall at CES. Clarion had this six-screen infotainment system on display. This technology is ready for the showroom, it’s just waiting on OEMs to spec it. Nuance had a demo of AI that used gaze tracking and natural language processing to understand search queries based on locations the driver is looking at. The augmented windshield was built by Saint-Gobain Sekurit. This demo was just as disturbing to my inner ear as the Honda one, particularly since the height at which the camera had filmed it all changed every so often, making you think the whole car had jumped. Over at Texas Instruments, I was rather impressed with this window display tech. It’s aimed at external displays, but I don’t see why you can’t just use the same idea to deliver cool in-car content. Like Holoride, exactly how the Dream Drive: Passenger experience ends up once on the market will depend a lot on the content that’s written for it. Unlike Holoride, it doesn’t involve strapping VR headsets on in the back seat, which means it ought to work in ride-hailing settings, too. (I don’t know about you, but I wouldn’t want to wear VR goggles in a car that wasn’t mine unless I knew for sure I wasn’t going to wake up in someone’s dungeon.) But I think here, too, some users are going to get motion sick looking down at tablets on the move—not that that isn’t happening on family road trips and school runs already. What made it even cooler was the augmented reality windshield, provided by Saint-Gobain Sekurit. Texas Instruments also had some technology demonstrations of augmented reality side windows, where a projector illuminated a thin film that’s in one of the sandwiched layers of the door glass. The ones I saw were monochrome (and technically designed for external displays), but the in-car applications are obvious. The automotive landscape at CES involved a lot more than just in-car entertainment, of course; stick around for the next few days as we explore what’s going on with the connected car (and how everyone is taking security seriously these days), plus developments (or not) in autonomous driving and electrification.